I know what you’re thinking. It’ll never happen. Why would a professional football club phone someone almost completely out of the blue offering them a game in the first team? But way back in March 1983 it did! In the depths of the Southend Borough Combination League, Barrie Delf was turning out as a centre forward for Leigh Ramblers 3rd team. In fairness he did have some experience as a goalkeeper. Some years earlier both Southend and Aston Villa had shown an interest in his custodian skills. 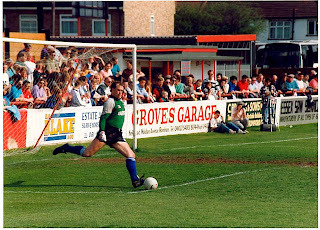 But with no firm offer on the table Barrie returned to the Ramblers and the unglamorous park pitches of South-East Essex. Monday 21st March 1983 seemed like any other day for Barrie Delf. He was working as a civil servant in Southend. He had played for Leigh Ramblers on the Saturday and was waiting for a telephone call telling him whether he was wanted by the 3rd or 4th team the following week. The phone duly rang, but it was not Leigh Ramblers at the other end of the line. During the 1982/83 season Southend United had two well-established goalkeepers on their books in the shape of Mervyn Cawston and John Keeley. Both had a wealth of Football League experience. Both had picked up niggling injuries and the Shrimpers had little in the way of back up. With the transfer deadline passed and other clubs reluctant to lend them a keeper, Southend were in a spot of bother, but with the doctor's report informing manager Dave Smith that Cawston’s injury should clear up the club believed a new man between the sticks would not be required. To be on the safe side, Smith turned to Barrie Delf. He had remembered his trial from some years earlier and asked if he would like to sign on non-contract terms to cover the situation. This was perfect for Barrie. Southend told him that he was unlikely to be needed, but that they would give him a few games in the reserves for helping out. Signing as a non-contract player also meant he could continue to work for the civil service. As the week progressed the local newspaper reported that Mervyn Cawston’s thigh injury had shown little improvement and that manager Smith was considering handing the position to Delf. Barrie had given the match little thought – in fact, he didn’t even know who the Shrimpers were facing that weekend – but with the papers speculating on his unexpected appearance, he thought that he should do some homework. Sheffield United were to be the visitors to Roots Hall that fateful Saturday afternoon. They were without question the biggest club in the Third Division at that time and would arrive in Southend with five straight wins under their belts. On the other hand the Shrimpers were floundering in mid-table with just one victory from their previous six games. It was turning into a story even “Roy of the Rovers” couldn’t have made up! The morning of the match arrived and Barrie received an early telephone call from Roots Hall. Mervyn Cawston had not recovered from his injury and Barrie was to play… talk about being thrown in at the deep end! Delf then had to make a phone call of his own. He had to inform Leigh Ramblers that he would be unavailable for their 4th team fixture that afternoon. Barrie turned up at Roots Hall. It was then that he encountered the first hurdle of the day. He had little idea where the players’ car park was. He asked a man on the gates for directions, but discovered the steward had no idea who he was and was reluctant to let him in! Delf finally persuaded the gate man that he was Southend United’s goalkeeper, even if it was only for that day. Barrie made his way to the home dressing room. He was introduced to the rest of the players – in most cases he had not met with his teammates before. Stricken keeper Mervyn Cawston offered some words of encouragement and asked if his young stand-in had any gloves? Delf showed him his somewhat worn and dirty gloves, which had only seen action in a few park matches. Cawston then presented him with a brand new pair that had been provided for him by his sponsors. Delf sat in the changing room in a bit of a daze. Could this really be happening? What were the players thinking about having a “rookie” amongst them? What if it all went wrong, would the good people of Southend ever forgive him? I guess either way they’d never forget him! Barrie’s mind was spinning, but he soon realised he was one of the first team when a group of local school children were shown in and along with the other players he was asked to sign autographs. The teams ran out on to the Roots Hall pitch with Barrie still barely believing the events of the previous six days. But he was really here now, living out every football mad kid’s dream. He was determined not to let anyone down. The match started quietly for Barrie. Sheffield United did not threaten his goal in the opening exchanges, but with former Southend favourite Colin Morris and high profile strike partner Terry Curran leading the Blades attack he knew he would need to be on his toes. His first duel with the deadly Blades attack came midway through the opening half when Sheffield were awarded a penalty. Nobody had given Delf any information on the visitors’ dead ball specialists. He made up his own mind which way to dive for the kick, which was to be taken by ex-Shrimper Morris, and guessed wrong. The Blades had the lead. The goal kicked Southend into life. Top goal scorer Steve Phillips tore into the Sheffield defence claiming the match ball with a stylish hat trick. The visitors’ day worsened when talisman Terry Curran was sent off after inciting the Sheffield United supporters after a clash with the young keeper. Delf had clawed the ball back from the goal line following a mad scramble, Curran had tried to kick both the ball and keeper into the back of the net as the Blades went in search of a way back into the game. The Sheffield player had tried to hoodwink the referee by rousing the Blades fans into believing he had scored. In the madness that followed, Curran was given his marching orders and with him went any chance Sheffield United had of winning the match. To this day Delf is unable to tell whether the ball had crossed the goal line or not. Southend won the game 3-1, the local press and Shrimpers manager Dave Smith heaped praise on the young custodian. But he would never play for Southend United’s first team again. The following week he was back in the Southend Borough Combination League with Leigh Ramblers’ 3rd team. The name Barrie Delf had not gone unnoticed. 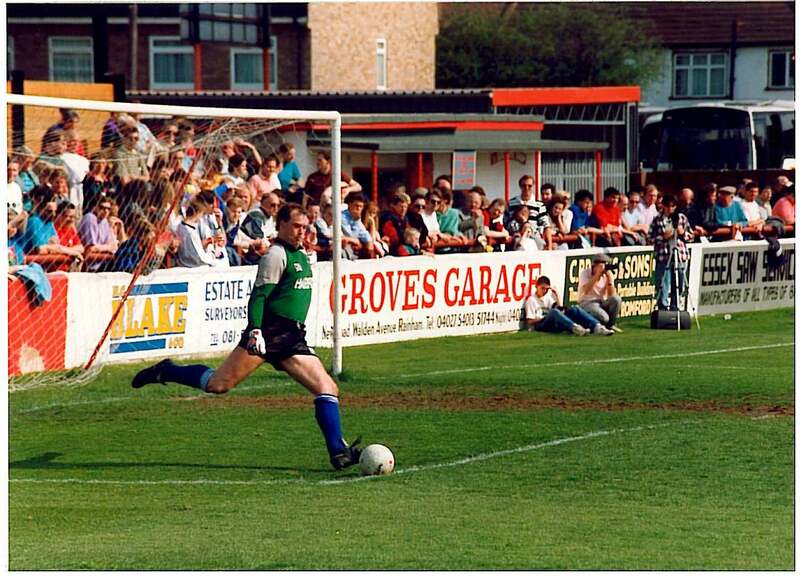 Former Southend player Peter Taylor invited him to play between the sticks for the club he now managed, Dartford. From there he returned across the Thames to Essex, joining Grays Athletic before returning to the Southend Borough Combination League with Second Division Little Theatre Club FC. At Little Theatre Delf served the club as a central defender during their promotion to Division One; his long, accurate passes forward setting up a number of goals for a young striker by the name of Jeeves! Barrie Delf in action for Grays Athletic.